EpiCypher SNAP-ChIP® Certified Antibodies are best-in-class reagents, with exquisite target specificity, less than 20% cross-reactivity and more than 5% IP efficiency. 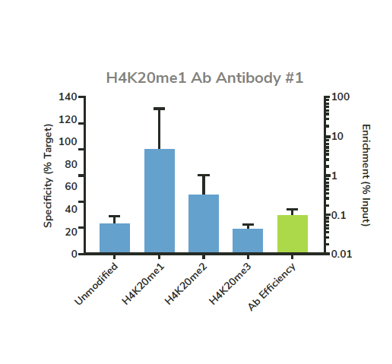 The graph below shows the specificity / efficiency profile for H3K4me1 antibody. Each of our SNAP-ChIP® Certified Antibodies exhibit outstanding in-application performance to deliver reliable ChIP data that you can trust. All have been extensively validated using SNAP-ChIP® spike-in controls (Cat. 19-1001, 19-2001). Join our mailing list to receive updates on new antibodies. Antibody screening services are also available test your favorite antibody. SNAP-ChIP® uses DNA-barcoded recombinant designer nucleosomes (dNucs) as next-generation spike-ins for ChIP (Right Figure). This technology enables the identification of high-quality antibodies by rigorously testing antibody performance directly in a ChIP application. In our recent paper published in Molecular Cell, we applied SNAP-ChIP to directly address the antibody reproducibility crisis. Conclusion: many commercial 'ChIP-grade' antibodies fail to perform as advertised. Histone post-translational modification (PTM) antibodies are commonly tested by histone peptide arrays. While this approach has long been considered the "gold standard" for histone PTM antibody validation, it is biophysically very different from ChIP. We recently tested the performance of 54 ostensible "ChIP-grade" commercial antibodies to H3K4 methyl states using both peptide array and SNAP-ChIP® (Shah et al. Molecular Cell). SNAP-ChIP® data is shown in the heatmap figure to the right. Using these approaches, we were able to identify highly specific antibodies for each H3K4, H3K9, H3K27, H3K36 and H3K36 methyl states. However, antibody specificity in peptide arrays had no predictive ability for specificity in ChIP. This is rather disquieting since various peptide array formats serve as the gold standard in antibody validation, but likely explains why so many incapable reagents have entered the market. Another key finding of this work is that the most commonly used H3K4me3 antibodies, including those used to generate many ENCODE datasets, are highly cross-reactive to H3K4me2 in SNAP-ChIP® (see heatmap). This means that many genomic areas reported as containing H3K4me3 are actually a result of a contaminating H3K4me2 signal. SNAP-ChIP certified antibodies must exhibit cross-reactivity to related PTMs less than 20%. For example, an antibody to a lysine methylation state (e.g. H3K4me1) is tested against EpiCypher's full SNAP-ChIP® K-MetStat™ panel containing unmodified, me1, me2, and me3 states at 5 lysine sites: H3K4, H3K9, H3K27, H3K36, and H4K20 (examples shown below), enabling assessment of antibody specificity relative to the most likely sources of cross-reactivity (e.g. 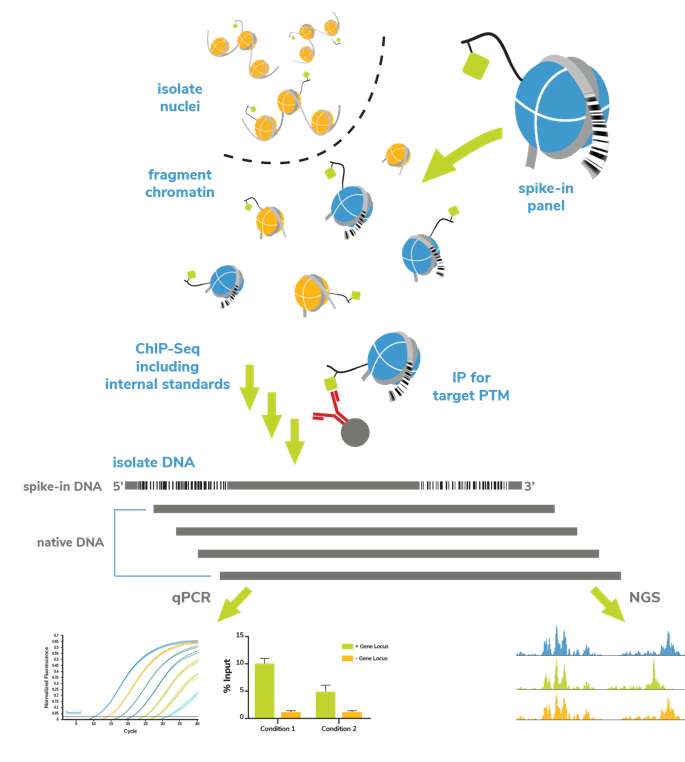 mono-, di-, and tri-methyl states) and the most widely studied histone methylation PTMs directly in your ChIP experiment. If even a single species in the panel exhibits cross-reactivity above 20% (Figure below right), we do not recommended the use of these antibodies for ChIP studies. SNAP-ChIP® certified antibodies must recover at least 5% of the target PTM after immunoprecipitation. Unlike sample chromatin where target PTM abundance is inferred by genomic loci controls (e.g. 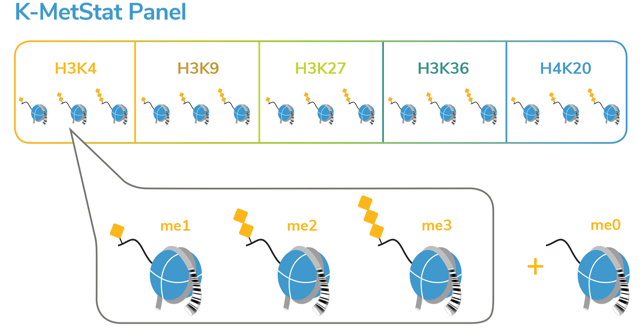 euchromatin vs. heterochromatin regions), a major advantage of SNAP-ChIP is that the amount of target PTM input can be precisely defined by examining the spike-in barcoded nucleosomes. By quantifying the amount of target remaining after immunoprecipitation relative to what was added in the input, the percent of target recovered (antibody efficiency) can be calculated. Antibodies with higher efficiencies are desirable since they can be expected to recover higher levels of the target PTM in the sample chromatin, resulting in higher signal and more reproducible ChIP data. Because antibodies with efficiency scores below this 5% threshold recover little of the target input, the resulting data is noisier and more unreliable. This can be observed in the SNAP-ChIP spike-ins, since each nucleosome in the panel is represented by two distinct barcoded DNAs (two technical replicates). In a single ChIP experiment with low efficiency antibodies, the two barcodes show a large discordance in target recovery (as represented by the standard error bars in Figure, right). Although antibodies can exhibit low efficiency but high specificity (Figure, right), such antibodies are still not recommended for ChIP due to technical variability resulting from low overall signal. PTMs in vivo are present at different amounts. Thus, any cross-reactivity observed in SNAP-ChIP should be taken into context with known abundances of the PTMs studied and on a on a case-by-case basis. Quantitative mass spectrometry analysis showed that H3K4me2 is 3-5 fold higher than H3K4me3 depending on the cell type examined (Peach et al., Mol. Cell. Proteomics 2012). Table shows PTM abundance in cells based on published mass spec data. 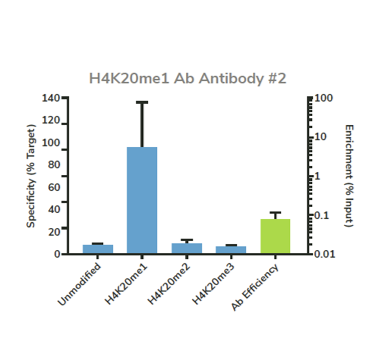 In the case of an H3K4me3 antibody that cross-reacts ~20% with H3K4me2 in SNAP-ChIP (Figure, right), such cross-reactivity will be 3-5 fold higher in sample chromatin, substantially confounding ChIP data. In contrast, a high abundance mark cross-reacting with a lower abundance mark will be of less concern. When reliable information regarding relative PTM abundances is available, EpiCypher considers this information when evaluating the suitability of an antibody for ChIP. EpiCypher has developed a powerful new approach to characterize antibody performance within the context of a ChIP assay. Using this approach, we are dedicated to deliver best-in-class detection reagetns for the epigenetics field. Below is a list and description of each SNAP-ChIP® available (or coming soon) from EpiCypher.